I love serving salads for lunch or dinner during the summer months. I always have random meats, cheeses, and an assortment of fresh fruits and vegetables that are salad ready on a busy Saturday afternoon. This salad takes advantage of rotisserie chicken leftovers and seasonal fresh, red raspberries. Prepare the Raspberry Vinaigrette. We use this recipe for a raspberry vinaigrette--but, you can use your favorite bottled raspberry vinaigrette as well. Prepare the dressing and chill--or simply chill a bottled raspberry vinaigrette until ready to serve. Choose the serving method. When I make dinner salads, like this one, for a group of four or less—I prepare the salad directly on the plate. Sometimes I actually toss the salad into one large salad bowl—especially when serving as a lunch or a side dish--but, I find that I have a better control over the mix of ingredients if I build each salad individually on a serving plate. Build the salad. If mixing all in one bowl, simply toss in the salad greens, onion, mushrooms, chicken, cheese, dried cranberries, and nuts. Toss and serve on individual salad plates. 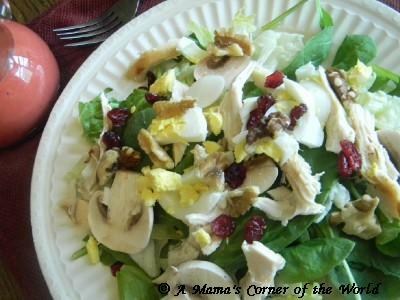 If building salads directly on dinner plates—begin by combining the spinach, onion and mushroom in a salad bowl. Distribute the salad mixture onto four large dinner plates. Top equally with the chicken, egg, cheese, cranberries, and nuts. Add the Raspberry Vinaigrette or other salad dressing. I rarely toss a salad with a dressing—especially one that tends to be spicy or tangy. Instead, I offer salad dressings on the side for personal drizzling. We serve with bread sticks or rolls.